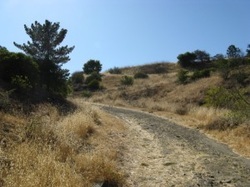 Terrace Hill is an inconspicuous but beautiful holding in San Luis Obispo’s ever-increasing open space lands. Geologically, this hill on the southern end of town relates to the Morro Peaks, a minor sister to the more famous nine including Bishop’s Peak, Cerro San Luis, and Morro Rock, and offers the best view for the shortest hike. Originally the land was owned by the French family, but was converted to open space to mitigate nearby development. With a long history of grazing, the hill was all but bare and needed much restoration. Lionel caught wind of the project and donated several hundred young oaks to the effort, as well as organized direct seeding of acorns across the slopes. Today, hundreds of those trees begin to reach maturity, contributing to the beauty of this precious local resource.